I just wanted to give a update guys. I have had no issues with the truck since I had to get it towed to the dealership and they performed the updates and flash. I did just knock on wood!!! I have enjoyed and will continue to enjoy my High Country, to be honest this might be my favorite truck I have owned so far. They actually performed a few different flashes on my truck. Chevrolet I guess is aware that this has occurred in small amount of trucks. This is happening to only trucks with the upgraded cluster. Since I had this done a while back I have not had any issues happen again with the truck. I got the GM Hard Tri-fold Tonneau Cover. I am super happy with it. It honestly is my favorite tonneau cover I have ever owned for a truck. You can view it on the GM Accessories website. Extra TPMS sensors supplied with your truck? Good news I called the dealership just a little bit ago and spoke to the Parts Manager/Customer Experience Manager where I purchased the truck and they were able to locate my Trailer TPMS Sensors. This is supposed to be done during the PDI process. The tech thought they were extra sensors for the truck. He is actually mailing them out to me. I suggest anyone else, who got a High Country and did not receive these to reach out to your dealership to check on this. Thank you. This should be fun I purchased the truck in the middle of October. I am wondering if these were in with nav SD card? The reason I am saying this my dealer actually misplaced my SD card, so they had to order me one that I got a few days after the sale. I purchased a High Country Silverado and did not receive these either. I actually just got my truck back from getting it ceramic coated as well as getting the front end Xpeled (clear bra). This was done by a local shop that does excellent work. Prestige Auto Armor, LLC out of Pittsburgh Area if anyone wondered. I got the truck 3 months ago and the truck currently has 3,202 miles on it. The truck looks great, actually better then the day I picked the truck up when I took delivery of it. The installer did point out to me that I am getting sandblasting, or paint chipping behind the rockers in the lower-front of the rear quarter panel of the truck, below the wheel well. The truck also has had molded splash guards and running boards from the day I took delivery. The truck has never even seen a dirt, or a gravel road. 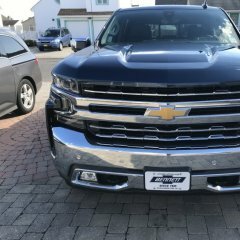 I have purchased 5 new gm vehicles since 2010 (2010 2LT RS Camaro, 2012 Cruze LTZ, 2014 Silverado, 2016 2SS Camaro, and this current truck). Even my 2014 Silverado that I owned for 5 years I did not experience any of this at all with over 50k on it when I traded it in on this truck. The installer did point out to me that my black High Country has extremely soft paint. Is this something I can get covered under warranty for being a paint issue? I think this is crazy for a 3 month old truck with 3k on it. I am wanting to get this fixed then Xpel the area after the paint has time to cure. This would not allow this to happen again. I would love to hear people's thoughts. Obviously I am not super happy when spending close to 60K on a truck, and I am a detail junky. GM does have a bulletin for this, so they are aware. Hopefully the information on here you can relay to service writer to get this resolved for you. I honestly think this might have something to do with one of the recalls. Besides this inconvenience I have been super happy with my Silverado since purchase. I believe it was a software hiccup of some sort that I'm hoping the one recall took care of. Did the Chevrolet Dealership that you bought the truck from perform the recalls before you took delivery of the truck? I do know so far the recalls have been vin specific. Also, I am curious to know if you lost any of your braking when the lights came on? I know after I restarted the truck a few times all the lights went off, and the truck seemed to be working totally fine. The service department was able to pull codes, they did perform the recalls, and made note of the main concern. GM is aware of this, but they are still diagnosing this, and did have techs perform some things in regards to this. It all depends on the shop and the type of coating you use. I am going through Prestige Auto Armor. They do many high-end vehicles. I actually used them in the past for my other vehicle. They will do a full paint correction. Then I am actually getting the entire truck done including the wheels, and all the glass. They are using CQuartz Finest Reserve. My truck is black, so I wanted to get the best gloss and finish. Only certain shops are allowed to install this if they have certain criteria and certifications. I am paying $1,895 to have this done. I could have used cheaper coatings as well. Update: So, I finally got my truck back yesterday. There was two recalls performed on my High Country while they had my truck. One was for the electronic cluster. Since the end of December GM put a bulletin out for Chevy High Country, GMC Denali, and equipped LTZ Silverados with the full digital cluster. I actually had this happen but the dash, would shut off for a few seconds then come back on like nothing happened. When this happened also none of the steering wheel controls would work either during that short period of time. This happened a handful of times since I purchased the truck in the middle of October. They have a update that fixes this problem. The other recall was something to do with the electronic parking brake. I will have to get the slip to look at this. As for the main reason for taking the truck in, none of the lights on the dash, or the DIC were on when the tech was diagnosing the truck. The service writer did also notice this when he pulled the truck in compared to last week. I am actually not the first person to have this happen with their truck. GM is aware of this problem, but they currently do no have a fix is what I was told. With the bulletin they did have the technician check all the connections with the truck, fuse box, and also inspected the battery itself, and also the terminals. They are hoping the flash has something to do with this, but I was told by the service writer if this happens again they do not currently have a fix for the problem GM is still investigating this issue. So this is something I will have to monitor. After I did pick up the truck yesterday I did have to take it for about a hour 1/2 drive to a shop where I am having clear bra installed and ceramic coating done to the truck. Nothing arose with truck. I am truly hoping whatever is was is fixed, or just a random glitch. No, I just finally got a rental car yesterday. They are supposed to be fully working on it Monday, and there is also two recalls that need done. It has been frustrating to be honest. Yeah, I totally understand that. That is why I want them to at least diag the problem, so things can get moving because if it is not until Monday when they can finally diag it, and parts need to be ordered it could be another week. I understand if they can't fix it right away.